Expression of the A204E mutant GHSR1a at the cellular level. (A) Specific binding of 125I-ghrelin to HEK293 cells transiently transfected with empty vector (mock), or HA-GHSR-WT (WT) or HA-GHSR-A204E (A204E), as determined on whole cells. Transfected cells were incubated over 4 hours at 4°C with 125I-ghrelin (30 pM). The specific binding, which represents the difference between total binding and nonspecific binding, is expressed as a percentage of the binding associated with the WT GHSR1a receptor. A representative experiment of 3 independent experiments (each performed in triplicate) is shown. (B) Displacement curves for 125I-ghrelin binding to whole HEK293 cells stably expressing the A204E mutant or the WT GHSR1a. The binding of 30 pM of 125I-ghrelin was displaced by increasing concentrations of cold ghrelin. A representative experiment of 3 independent experiments (each performed in triplicate) is shown. (C) Immunolocalization of HA-tagged WT and A204E mutant receptors transiently expressed in COS-7 cells (×40). The immunostaining of HA-tagged GHSR1a receptors was performed by means of an anti-HA monoclonal primary antibody incubated in the absence or in the presence of a permeabilizing reagent in order to visualize the receptors located at the cell surface or at both the cell surface and the intracellular level, respectively. 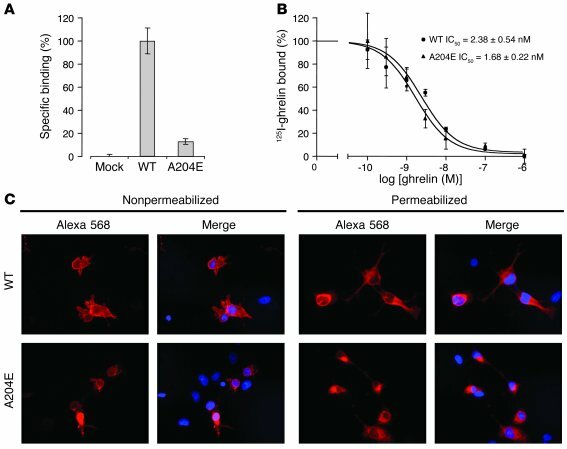 Anti-HA mAb labeling was revealed by an Alexa Fluor 568 goat anti-mouse secondary antibody. Merge pictures show the anti-HA Alexa Fluor 568 staining (red) together with the staining of nuclei with DAPI (blue).